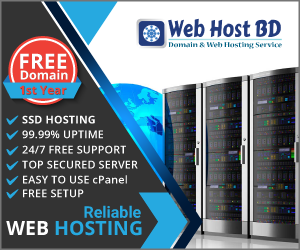 Web Host BD is a web hosting company in Bangladesh where you can buy web hosting and domain service. Web Host BD’s all services make it affordable. I have also given the Hosting Company details that indicates the value of Web Host BD. You can understand that Higher the value, higher the importance. I have mentioned how much their unlimited disk space and unlimited bandwidth hosting actually is. Before you decide to buy our Cheap Business web hosting in Bangladesh, at first you must consider two important factors that is depending on how big your website is going to be and how many visitors you will be expecting to your site, is disk space and bandwidth. Generally a 200 page website with images and text would probably require about 50 MB of disk space and ideally about 1Gb to 5Gb of bandwidth. In my opinion what I would ideally look for in addition to the above would be the hosting company’s uptime and also whether they have live chat. Having a 24 hours live chat is of great help and eases your frustration of having to wait for an answer once you submit a ticket to get help, if you are having a problem with your website. If you do have a problem with discount or anything else please email me at webhostbd.com@gmail.com with the subject “Problem with hosting” and I will get back to you as soon as possible. All our hosting packages come with different disk space, bandwidth, email accounts and many more. We start our each package with a set limit but If your need more, feel free to contact us to request additional resources and we will increase it according to your need. Our new plan allows us to create more efficient use of our servers and provide better, faster and more reliable hosting for our customers. A lot of website builders use Linux web hosting. It is known that Linux is the most stable operating system since it is an open source operating system. The code is accessible to the public; therefore there are a lot of chances of improvements. Linux has been developed in various flavours, over the years, such as Debian and Red Hat. In order to make Linux web hosting run faster, thousands of people have contributed to provide more efficient, simpler, and bug free code. Problems are seen relatively quickly and improvements are made on a continual basis.